Traveling in circles? That’s not the goal in the air or out on the highway, of course, but it’s definitely a good thing when it comes to historical merry-go-rounds or carousels. Here’s are a few cool carousels I found while putting together a slide show called “Perfecting the art of the spin,” for msn. 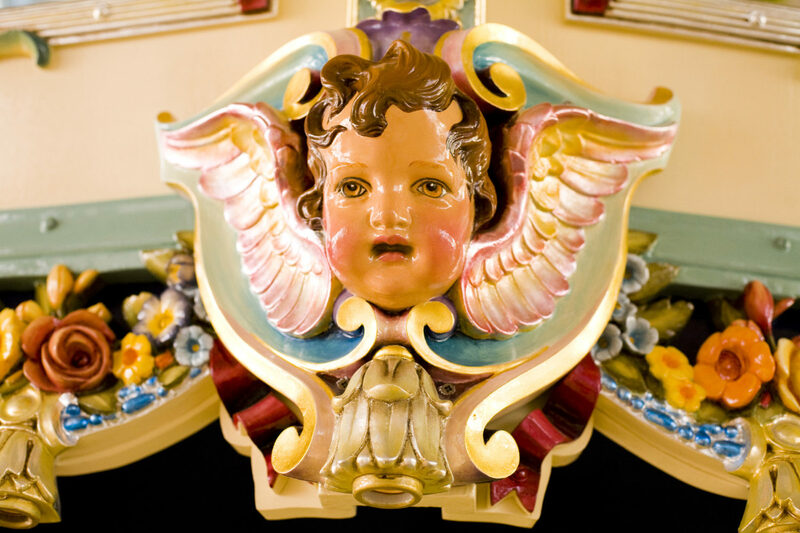 In addition to artifacts relating to the life and work of carousel manufacturer C.W. Parker, whose carousels—or, as he called them, “Carry-Us-Alls”—were featured in carnivals and parks around the world, the C.W. Parker Carousel Museum in Leavenworth, Kansas has three operating carousels: A 1913 Parker Carry-Us-All (with 24 horses, two rabbits, three ponies and a spinning “lover’s tub,” above); the 1950 Liberty Carousel with 20 aluminum horses; and the Primitive Carousel, made sometime between 1850 and 1860, a hand-cranked model with horse bodies made of hollowed out logs. The 1905 Philadelphia Toboggan Company Carousel No. 6 – now the Kit Carson County Carousel in Burlington, Colo. – “is not the biggest or the most elaborate carousel, but it’s the only carousel in America that still has original paint on both the scenery panels and the animals,” said Jo Downey, project director for the Kit Carson County Carousel Association. “And at almost 12 mph, it goes 50 percent faster than the average carousel.” The carousel counts a lion, a tiger, a dog, a sea horse and two donkeys among its 46 animals. Not dizzy yet? Take a look at the full “Perfecting the spin” slide-show featuring carousel museums and carousels in museums. Airports tend to be known more for their security lines than their architectural ones. But there are a batch of new and “new-ish” terminals worth a stopover – some for their outstanding views; others for their pleasing amenities. Here’s a link to my MSN.com article about nine new airports worth a look-see. If you’re lucky, you have more than one airport within driving range and have figured out how to use that to your advantage when shopping for airline tickets. But as long as you’re putting all your luggage into the car, why not just fill up the tank and keep going? To help you plan your route, here’s a link to my recent MSN.com article: 12 Museums to Fuel a Road Trip.